Lets be honest, I’ve never met a crepe I didn’t like. Just like chocolate, I was brought up to adore crepes. Typically, my mom would always be all about ice cream, but since I started making them, and letting my imagination run a little wild, we’ve realized that savory are just as delicious as the sweet! So, on a totally random note, lets talk about colleges. My younger brother is looking into colleges to transfer to for next year (he has been attending Colorado Mountain College online) and so far he has the University of South Carolina on his list. That’s it. I keep telling him he has got to go look at other schools (his grades are pretty good), but he’s a little unmotivated. SO, I am trying to be the best big sister and help him out, but ahh…I got nothing. So tell me, what are some good schools along the East or West coast. He does not want to be in the middle of the country, so you know, California, South Carolina, North Carolina – places like that. I am all for him staying in Colorado, but ya, he’s not really into that. Any suggestions? And double also? After spending a week in Florida and doing a decent amount of cooking? I am realizing that cooking and baking at sea level is about ten times better than cooking at 10,ooo feet. Not going to lie, being in Florida made me second guess where I live about a million and one times. Things grow in Florida. Where I live, things freeze…even in the summer. Ok, ok. Done with my personal babbles, on to pretzel crusted chicken and brie crepes! I decided to do a crusted chicken with crushed pretzels, walnuts and a little seasoning. 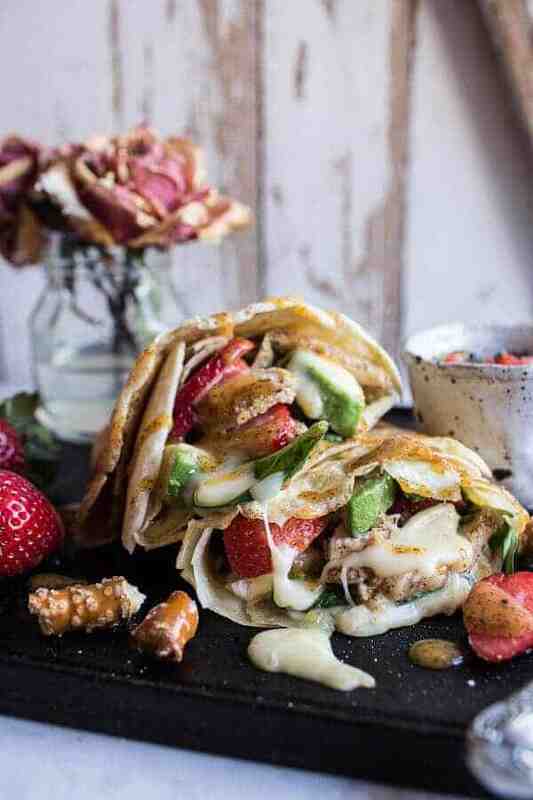 You could even make the chicken for dinner and then use the leftovers for these crepes. Double meals. Yes! I have done a ton of sweet crepes lately, so when the idea for a savory crepe came to mind, I went with it. I then proceeded to add lots and lots of brie cheese because well, crepes and brie and honey mustard just sounded like a really delicious combo. Honestly, all I really NEED in the crepes are some melty brie and honey mustard. I mean, the other stuff is good, but the brie and honey mustard are where it’s at. It’s sort of like a fancy grilled cheese, but obviously so much better. HELLO, they’re with crepes!?! These crepes are so fun, quick and easy. Perfect for upcoming Mother’s Day or really just spring and summer in general. The rest is simple, feel free to adapt as you like, but like I said, just make sure to include the brie and honey mustard. As long as you have them, you will be golden. Oh but wait, that salsa. Yes, you MOST DEFINITELY NEED that salsa. Duh. In a large bowl, combine the honey, mustard, egg whites and seasoned salt, whisk well. Toss the chicken in the honey mustard wash and set aside. In a shallow bowl, combine the crushed pretzels and walnuts. Remove one piece of chicken at a time from the mustard wash. Place in the pretzels crumbs and then use your fist to pound the pretzels onto the chicken. Place on the prepared baking sheet and repeat with remaining chicken. Mist the tops of the pretzel crusted chicken with nonstick spray. Bake in the oven for about 20-25 minutes, flipping chicken halfway through baking, until the chicken is cooked through. Slice the chicken into thin strips. While the chicken cooks combine all the ingredients for the dressing in a small bowl or glass jar. Whisk well and adjust seasoning to taste. Any leftovers can be stored in the fridge. 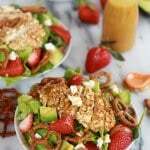 In a bowl, combine the strawberries, avocado, jalapeno, basil and lime juice. Gently toss and season with salt if desired. Store in the fridge. Heat a large skillet oven medium heat and add 1 tablespoon butter or olive oil. Working with one crepe at time lay the crepe flat in the skillet. Lay a few slices of brie on one quarter (basically make a triangle) of the crepe. Next, layer on the spinach and sliced chicken. Drizzle the chicken with the honey mustard dressing and then add a little salsa. Top with a few more slices of brie. Fold over the bottom of the crepe and then fold it over again to make a triangle. Cook for about 2-3 minutes and then flip and cook another 2-3 minutes or until the brie is all melty and gooey. Repeat with remaining crepes. Drizzle with the honey mustard dressing. EAT! 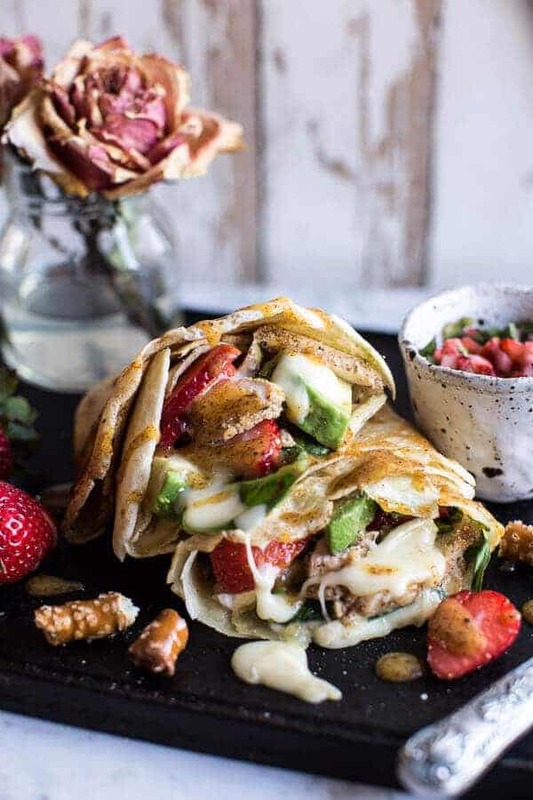 *This is my favorite [buckwheat crepe | https://www.halfbakedharvest.com/caramelized-peach-cherry-prosciutto-gorgonzola-salad-wbuckwheat-crepes/] and this is my favorite [whole wheat crepe | https://www.halfbakedharvest.com/spinach-artichoke-and-brie-crepes-with-sweet-honey-sauce/]. You may also use tortillas if you'd prefer. And now you are golden! 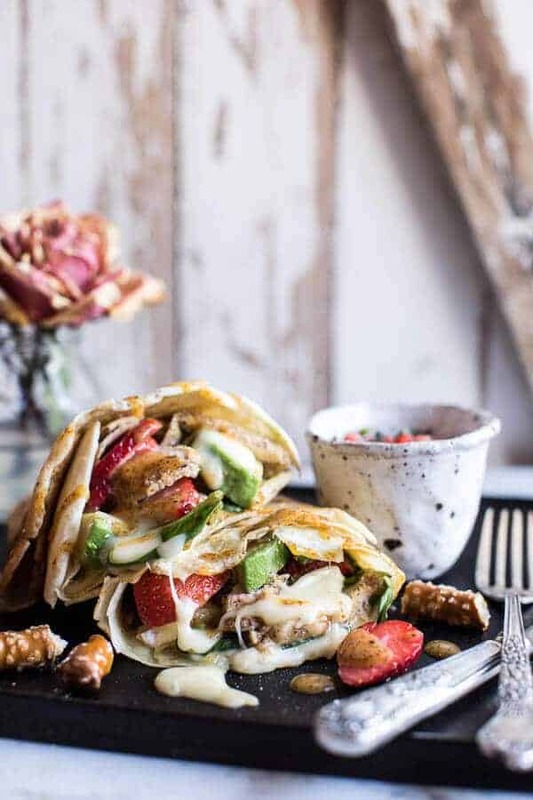 I’ve never tried strawberry with savoury food but this looks so good I’d be willing to give it ago. These look delicious! Strawberry and chicken??? Must try! Looks like a generous and flavorful meal. gorgeous! i wish i could beam this over to my desk right now. Thank you so much, Scarlet! Have a fun weekend! 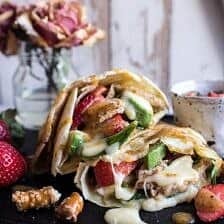 I love pretzel crusted chicken and with melty brie and honey mustard stuffed into a crepe…holy yum that sounds incredible. We have some awesome colleges on the east coast but remember it’s the student not the college that gets the job…he needs to go somewhere that he feels most comfortable and can get the best experience out of his time there…college can be some of the best years of your life..at least I thought so it was a blast. Thank you so much and good luck with the colleges! 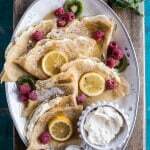 I love crepes, growing up we always ate a variety of different crepes, with cream cheese filling being the most popular! This looks like an amazing combo! This looks fantastic and I have all ingredients except the basil on hand! WIN WIN! Thanks Kathy! Hope you love them!! Ah, these look so good! 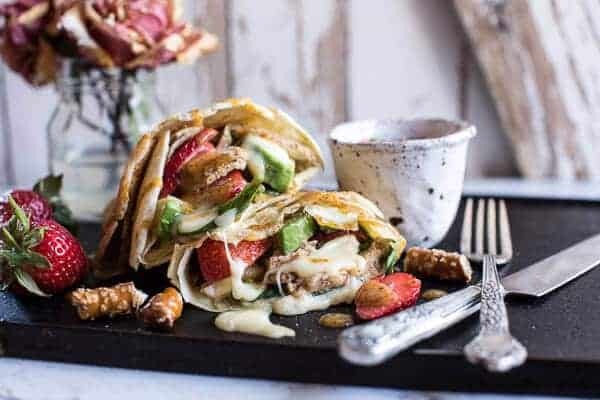 I love salads topped with chicken, strawberries and honey mustard, so these crepes sound delightful. As far as East coast college recommendations, I have to throw my alma mater, Georgia Tech, out there if he’s at all interested in engineering or sciences. It’s a highly ranked school with a beautiful campus nestled in Midtown Atlanta (a scrumptious foodie scene). And I know many people who go to the University of Florida or Florida State that absolutely love their schools and get a great education in a beautiful place. And think, then you could go visit him in sunny Florida, haha! Wow! Can you believe I have never had a crepe? I think I would want to start with savory because this is making me drool!!!! As a North Carolina native (that state has my heart), I have some great college recommendations. I went to the University of North Carolina at Chapel Hill so that school would be my #1 pick (DEFINITELY NOT DUKE!). University of North Carolina at Wilmington, though, sounds like a place your brother might like. It is on the coast of NC, so plenty of outdoor activities at the ocean (I know your brothers are into snowboarding so perhaps surfing would be fun!). There’s also Elon University, High Point University and Appalachian State University. NC really has great schools! Feel free to contact me if you need/want any further info! I follow many food blogs and last week I found you through a pinterest pin. You are one of the most talented food bloggers I have ever read bar none. You should be up for a Saveur award. I cannot believe how young you are to have all of this talent. All I can say is WOW!! Thanks for your recipes – I LOVE seeing you in my inbox! What an awesome college!! Totally going to suggest it to him! 🙂 Also, such great advise!! I am from NC so I have to rep either UNC or Duke, both are AMAZING schools! Also, if he is looking for something a little less intense, UNC Wilmington is a great school right on the beach! Ok, now back to these incredible looking crepes! Seriously, I am DYING over these photos! Can’t believe how yummy these look, Tieghan! Oh on the beach sounds kind of awesome!! LOL! Thanks for these great recommendations! Im with team NC, we have some of the best schools in the nation. I went to UNC so I’m partial, but there are so many great choices. I love NC because you can go to the beach one weekend, and the mountains the next. Asheville is amazing! Thanks allyson! Have a great weekend! You had me at “pretzel”. HA! Seriously there is a lot going on with this one but it looks really good. I have a feeling the honey mustard flavor will pair well with the strawberry salsa. Genius! Thank you so much, Heather! Have a great weekend! This is one of the most delicious recipes I’ve seen in a long time! Definitely going to try it! These crepes are calling my name! They looks super delicious! Get in my mouth. Going to make this tonight, but since it’s nice out we’re doing a non-crusty (still honey-mustardy) grilled version of the chicken, and stuffing all the goodies in some lightly oiled, grilled pita pockets. I’m unreasonably excited. Thanks for the post! oh yum! I bet that will be awesome!! Enjoy! I know know what perfection looks like! 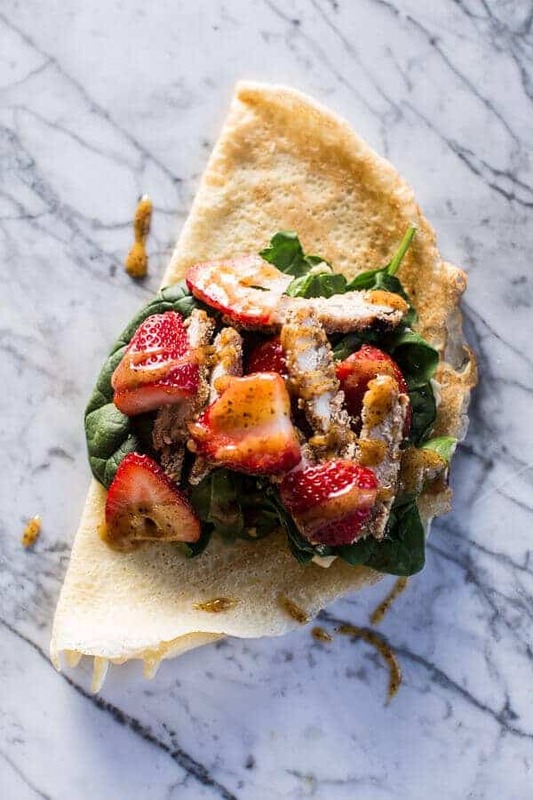 That chicken, the strawberries, the basil, the salsa! I love em all! Haha! Thank you so much, Meg! Have the best weekend!! 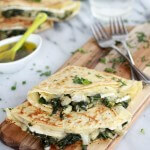 Savory crepes are so good, these look killer! Love that strawberry basil salsa! This recipe combination…I can’t even handle it. The combinations you come up with are just amazing! 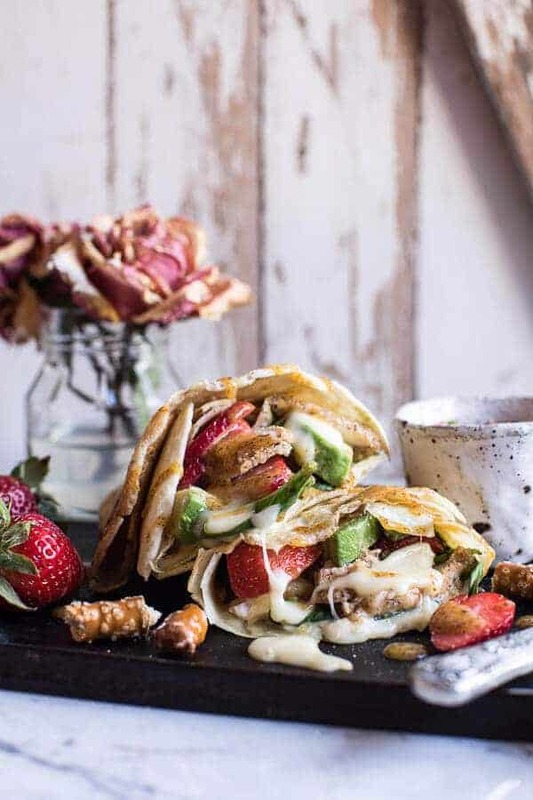 These sound so great- the idea of brie and strawberries together is making me swoon. No one has talked about California schools (sob). The UC and CSU systems are pretty nice (I currently go to a UC), though they are notoriously expensive for out-of-state and international students. They’re all over the state with all sorts of majors, so there’s plenty of different choices. Yeah! CA schools!! 🙂 Thanks for the suggestions! 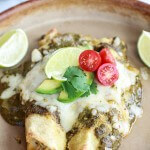 Wonderful recipe – consider the University of Texas at Austin? My alma mater and Austin is AMAZING! Superb university – large but wonderful campus and great teaching. The recipe looks yummy! On the college note, I’m another North Carolinean…and we do have several top notch universities. I went to NCSU, and it’s definitely a a great school! The location is also the best. However, the recommendation for a specific college should be based off what your brother wants to major in. I’m crossing my fingers that when I have children they will want to major in something State is known for…go PACK! Just a question, where do the walnuts come in? Cuz ive searched in the directions and didn’t find them. Back to the Food… I stoked to try this recipe you had me at Pretzel and strawberry. Great job you’ve done here! This whole blog is a work of art. I made these the other night – so good! Plus I have left over crepe making goods for other fun things (warm peach and strawberry crepes with coconut cream, anyone?) and the baked chicken was perfectly cooked/tasty so great for a regular salad topping. Great work! SO happy you loved them!! Thanks Abby!! Can’t wait to try this! It looks like a meal even my daughter will like. Have your brother look at Endicott College in Beverly MA, gorgeous campus right on the ocean and a cool little town 20 minutes north of Boston. The college is a mile walk to the train and you can head to Boston anytime! Hey Tieghan! I made these crepes last night and they turned out amazing. They were a lot of work because there is so many different toppings to put inside! Definitely well worth the time though! Plus the fam LOVED them which was such a bonus! First time ever eating crepes which is so embarrassing, but true. The strawberry salsa was my favorite part which is crazy since I was iffy about it at first. Also love the honey mustard dressing with all the gooey brie cheese and moist chicken. Perfect combination! Keep the recipes coming girl! I love your recipes and am always making them. You really have talent!! THANK YOU!! So excited you loved the recipe, that makes me so happy! 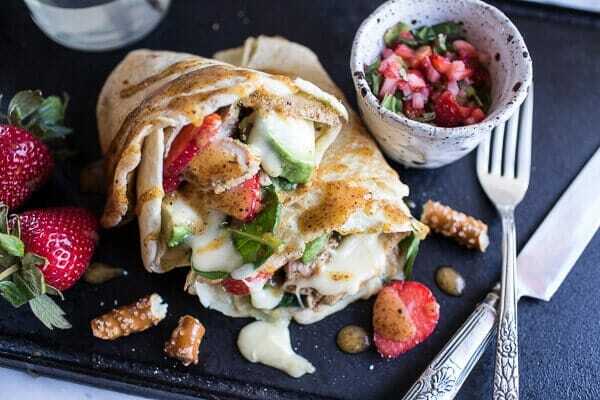 Crepes are my favorite as is strawberry salsa!